On November 6, 2017, I am honored to help lead a class discussion on war and trauma at Governor’s State University in Chicago. This coursework is the result of winning a grant from the National Endowment for the Humanities. The grant topic is for the Dialogues on the Experience of War. Veterans oral history projects are a natural fit for such topics as they necessarily develop and encourage discussion concerning war experiences. Outside of preservation and access, one mission of the Making History Project is to compare and contrast combat veteran trauma across the generations and conflicts. Of special interest are the similarities and differences, if any, amongst combat veterans from different conflicts. The goal is to better understand combat trauma and hopefully contribute in some way to the research of this under-developed topic. The course itself at Governor’s State University is completely unique to this genre. 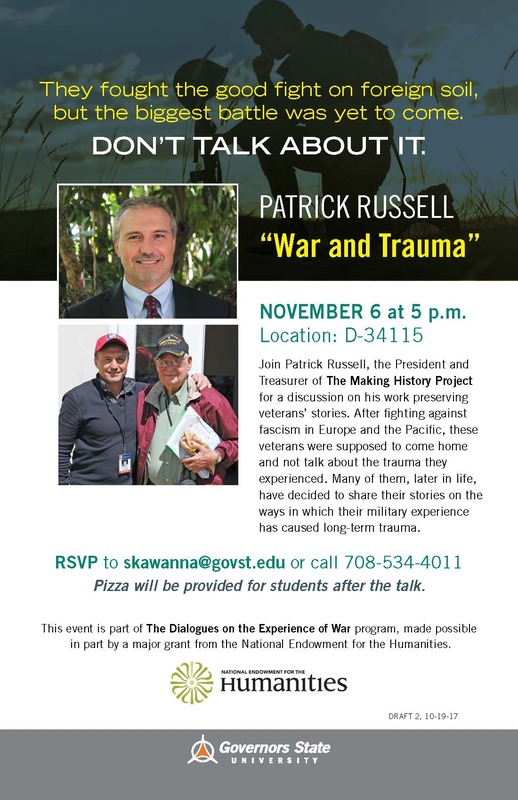 Students will be learning about combat trauma across the generations from World War I to the present through literature, poetry, film, and oral history. Best of all, there are five Veterans participating in the class as team leaders to help stimulate additional thought and discussion by sharing their own insights and experiences. The course yearns to be an immersive experience in which all participants are sure to grow and develop a greater appreciation for what military veterans go through in the service of their country. In the end, the course will culminate with a veteran town hall in which students, team leaders, and members of the public will discuss what they learned and what it means to them. I am looking forward to meeting the class and sharing what I have gleaned from the oral histories that I have taken. I imagine we will have a very interesting and stimulating discussion. Perhaps this passion will rub off and some students will decide to engage in their own oral history projects to preserve our past for future generations.